« Christmas: Christ Mass or Mess? Nancy, Beautiful and I learned something new for which I am always grateful. Another one to pass along and share. 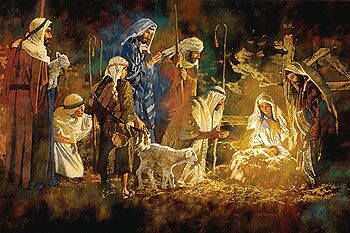 Pray you all have a very special and Blessed Christmas! Thank you, Janet. I, too, learned as I researched. And thank you for your prayer. May you also have a blessed Christmas with your family! Thank you, Janet. I, too, continue to love learning. ‘Glad there is someone else out there to join me! We did have a blessed Christmas, with children, in-laws, and grandchildren gathered around. Only Heather’s husband couldn’t come because of his work schedule. However, he graciously sent H. and Sophie without him. We are so blessed with our loving family! Thank you for the tweet, Jean, and for your prayer that we have a wonderful Christmas. Plans for family gatherings are in place, providing much anticipation of “wonderful!” Merry Christmas to you, too, friend! This year my mind seemed to focus as much on The Gift of Salvation via the Cross as it did on Christ’s birth. I was delighted to learn about the meaning behind “The Holly and the Ivy”. I will never look upon holly and ivy the same way again…with tears and thankfulness. Indeed, tears and thankfulness. Surely such a heartfelt response (from such a sweet-natured woman–you!) warms God’s heart. Blessings to you, dear friend! So glad you had a wonderful Christmas. We, too have numerous memories to savor from Christmas 2015. A few highlights: Elena became an enthusiastic gift-unwrapper, Eric cooked a superb gourmet dinner for the eleven of us, Six year-old Sophie invented a dodgeball-type game played with potholders (!) that had us in stitches.